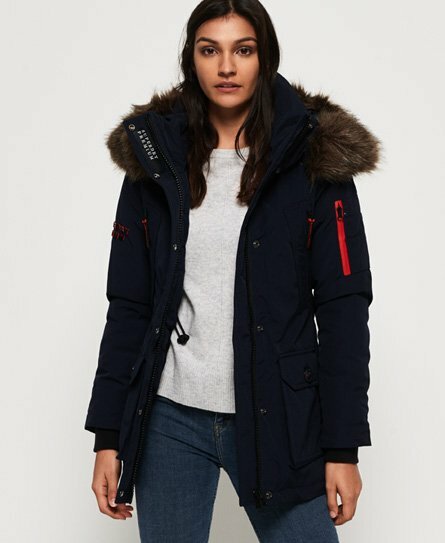 Superdry women's Premium Down Alps coat. Stay warm and stylish this season in the Premium Down Alps coat, featuring a 90/10 premium duck down filling with very high fill power rating, bungee cord hood with detachable faux fur trim and a zip and popper fastening. The coat also features 8 front pockets, sleeve pocket and an adjustable waist so you can create your perfect fit. Finished with a Superdry Premium badge on one sleeve, the Premium Down Alps coat is the ultimate winter warmer this season.